Gene targeting is a technique that uses homologous recombination* to take an organism's original DNA and make changes to a specific gene; it can be permanent or conditional. Gene targeting is different from transgenics in that it does not use genes from foreign species to change an organism. Instead, gene targeting will work with the DNA of a live organism. Gene targeting is still very closely related with transgenics because both make changes to the genetic makeup of animals that can be used as models for disease. This new DNA will then be inserted into a culture of embryonic stem cells, and those which express the inserted gene will be placed in the embryo of the host mother. In homologous recombination, pieces of similar molecules of DNA are broken off and joined together during crossing over. To carry out homologous recombination, the gene of interest must be identified and sequenced. After this gene is specified, a DNA construct* must be made, which includes the gene or alleles meant to replace the targeted gene, flanking sides that are identical to the original DNA and selection markers, and each gene requires a specific vector. This construct is then added to cells containing the targeted gene of interest and the construct lines up with the original piece of DNA. Then the original piece of DNA with the targeted gene and the construct containing a new gene will perform recombination. In yeast recombination almost always happen at the correct locus*, but that is not the case of mammalian genomes, in which recombination rarely occurs at the right locus. Due of this, the embryonic stem cells must be screened by Southern blot* or PCR *to discover which clones were correctly targeted. This will end up in a new piece of DNA that has replaced the targeted gene with the new construct that will be inserted into the chromosome and later into the embryo. Gene targeting is used to add or remove “knock-out” and “knock-in” mutations, which help the study of human genetic diseases and make animal models. 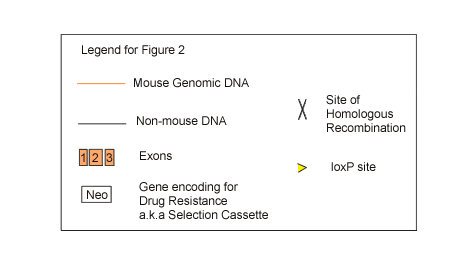 “Knock-in” organisms, usually mice, are used to study the expression of inserted genes and proteins. 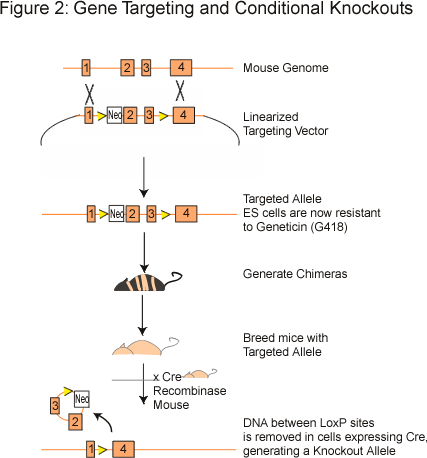 The knock-in mice are constructed by inserting transgene at a specific locus and carrying out homologous recombination at a specific, non-critical integration site*, which gives researchers more control over the situation, allowing them to escape troubles that come with standard transgenic methods. By using the knock-in method, it can be ensured that the DNA will not enter into numerous locations, and that the new phenotype of the organism was caused by soley the targeted mutation. Although this method has its benefits over standard transgenic techniques, it takes longer to select which embryonic cells have received the transgene. “Knock-out” organisms however, are used to examine organisms after certain genes are extracted. These genes can be deleted by random mutagenesis or gene targeting, where homologous recombination can be used to remove exons* from a gene. The phenotypes for knockout mice differ, because often the mutation of a gene can have an effect on other tissues and genes. Fig.7. Difference between Transgenic and Knockout or Knockin mice.